Labels and packaging are high on HP’s list of product applications. It’s not the only way to measure the extent of a vendor’s ambition, but the size of its preparations for a drupa event is a reliable gauge. By that yardstick, HP’s ambition is towering. By the time drupa 2016 opens on May 31, the company will have filled a space the size of a soccer field in Hall 17 with 56 pieces of printing machinery—230 tons of equipment in all. This gear, says HP, will operate as one of the world’s largest digital print factories built during a trade show. It also will make HP the single biggest exhibitor at drupa and the first digital systems supplier to achieve that distinction. But, even if visiting printers are duly impressed by the sheer physical dimensions of HP’s presence in Hall 17, why should they care? The company tried to make that clear in a pre-drupa media briefing in Israel last month. The briefing, attended by 60 international journalists and analysts from 20 countries, heralded the launches of no fewer than nine new digital presses—probably a record number of introductions at a show preview of this kind. That was the “what.” Discerning the “why” took some careful listening to the remarks accompanying the product announcements. Clear from the presentations was HP’s sense of itself as the leading agent of change in the industry’s shift from conventional to digital production. This is a presumption that other vendors can challenge, and it’s no less a presumption than the idea that the digital equipment market is ready to absorb nine new presses from any single source at one go. But, vendors that want to gainsay HP will have to show that they are pursuing ambitions of their own on the same grand scale. 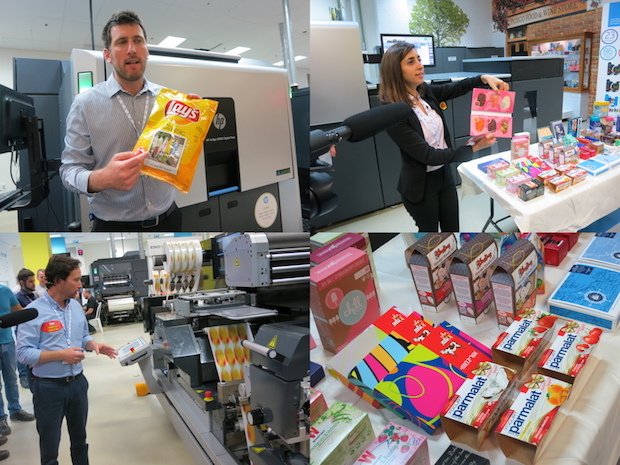 Other press manufacturers have tried to position themselves as one-stop equipment suppliers for the range of high-value applications that HP is targeting: commercial, publishing, photo finishing, labels and sleeves, folding cartons, and flexible packaging. Some have managed to touch these bases, but at drupa 2016, it probably will be impossible to find a vendor that offers a more comprehensive set of solutions for print service providers in the segments than HP. Something else the competition will have to match at drupa is HP’s time-to-market commitment. During the briefing, Alon Bar-Shany, general manager of the HP Indigo business unit, said HP won’t exhibit anything that it isn’t prepared to ship commercially within 12 months—a tall order for any company about to push as many fresh-out-of-R&D devices into the new-product pipeline as HP. Still, the digital print market’s vigorous appetite for HP presses is a matter of record. The worldwide installed base of HP Indigo series 4 presses—models 10000, 20000, and 30000—exceeds 300 across 38 countries. About 3,000 Indigo presses in series 3 (the 7000 and WS6000 platforms) are currently in operation. HP estimates that users of presses with Indigo LEP (liquid electrophotography) technology will print 30 billion pages on them this year. LEP has been an HP property since 2001, the year HP acquired the company (Indigo N.V.) that first brought it to market in 1993. HP expanded into high-volume production inkjet with the introduction of its first machine of that type at drupa 2008. Now the series is called PageWide Web Press, and while HP won’t disclose the size of the installed base, it does claim that PageWide presses now account for about one-quarter of all pages coming from production inkjet devices. PageWide customers are said to have cumulatively printed 150 billion pages on the machines since 2010. As adoption of HP technology expands, so does the scope of its applications. Bar-Shany said that even as it nears 25 years on the market, LEP remains a “relatively young technology” that is “still very much climbing the S-curve” of market opportunity. What customers are telling HP, he said, is that they need “a system, not just a press”: an integrated offering of machines, software, and technical support to help them capitalize on all of the things that digital printing can do. Another trend, said Bar-Shany, is that the conversation about digital printing is moving from cost per page to cost per job as customers learn how to make the changing economics of digital production work in their favor. He also spoke of a “turning point” in the adoption of Indigo LEP by brands that have seen the technology measure up to their critical print quality requirements. To illustrate it, he showed a collage of the logos of more of than 60 household-name consumer goods producers said to represent “brands that love HP Indigo print.” Bar-Shany predicted that when brands like these realize what the newest Indigo equipment can do for them, they will say “I can do anything I want now” with digital printing. Like any other print systems provider, HP believes in showcasing customers whose enthusiasm for digital printing matches its own. One such customer is the Lindsey Yates Group, a Sydney, AU, firm that installed an HP Indigo 10000 B2 sheetfed press last year. Bar-Shany quoted the company’s owners as calling the press “a hungry beast” capable of devouring hundreds of jobs of day. In Germany, said Bar-Shany, HP has a customer that aspires to do one million jobs per year on its Indigo equipment. But, even with gung-ho adopters like these, there’s no flat guarantee of success for HP in any of the markets it where it wants to drive production from analog to digital. At most, digital printing accounts for only about 2.5% of all printed volume, and in some applications, its penetration has been nearly too small to measure. This is part of the hardware for HP Indigo Pack Ready Lamination, a quick-turnaround solution for making flexible pouches. Packaging, noted Bar-Shany, “is almost untouched by digital,” and its uptake in that high-volume environment admittedly is a “big if.” That doesn’t deter HP. Two of the new LEP presses—the HP Indigo 8000 and the HP Indigo WS6800—are primarily for labels and packaging, which can be produced on others in the family as well. Top liner for corrugated cartons is what the PageWide inkjet press models T440S and T1100S are designed to print. HP also is breaking into flexible packaging converting with a technology it calls HP Indigo Pack Ready Lamination. Bar-Shany expressed confidence that HP’s $100 million annual investment in R&D will give the company’s solutions for packaging and other applications the market momentum they need. David Murphy, worldwide director of marketing and business development for the PageWide Web Press division, echoed some of that confidence from the production inkjet side. 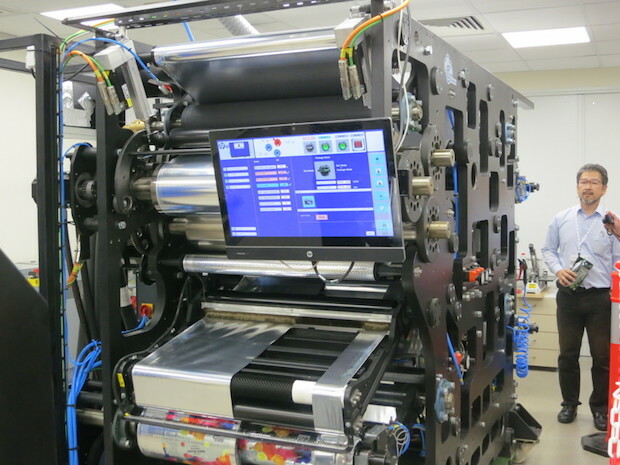 PageWide technology, he said, is “reinventing” production inkjet by making it competitive with offset in volumes that typically belong to that process. High-volume production economy and quality on par with offset lets PageWide presses move into applications that were “previously unthinkable” for inkjet, according to Murphy.